It's great to look good. But it is better to be seen looking good. Introducing Lin Manufacturing's newest performance sock: the Reflectorz. The only sock of its kind, the Reflectorz features a 1/2 inch cuff strip that reflects light. So now bicycling, running, or hiking at night is both safer and fashionable. But the Reflectorz doesn't stop there. Like all Lin performance socks, the body of the Reflectorz is produced using a Core Spun CoolMax" process which blends CoolMax" yarn (which dries 70% faster than cotton) with DuPont Lycra". The combination guarantees a sock with increased durability, superior moisture control, added strength, greater stretch recovery and enhanced fitting. 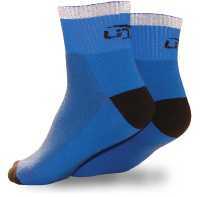 Add a nylon sock shell which is five times stronger than cotton or acrylic, and a Flexgrip Elastic ankle that delivers both comfort and staying power, and you have an unequaled sock. Your feet stay happy whether you're mountain biking a single track trail in B.C., running an ultra-marathon across the desert, skiing fresh Utah powder, or driving your kids to the mall. "We are very proud of the Reflectorz," says Lin Manufacturing president, Hillary Lin. "We believe it is very important that people are seen when the exorcise at night. The Reflectorz gives them that much more visibility." In addition to the Core Spun sock, the Reflectorz is available in Lin Manufacturing's Airlift cushion sock model. The Airlift is manufactured with multiple loops of Coolmax, trapping small air pockets which act as mini shock absorbers. The Airlift offers just enough cushion to lessen the impact of feet on pavement, trail, court or pedals. Also, Lin Manufacturing is offering a shoe cover featuring a Reflectorz strip around the ankle. MSRP of the Reflectorz sock is $12.99; the Airlift with Reflectorz has and MSRP of $14.99; and the shoe covers retails for $16.99. Lin Manufacturing & Design has been designing, testing and producing high-quality socks in the heart of the fitness outdoors since 1990. The company's website it at www.linmfg.com.